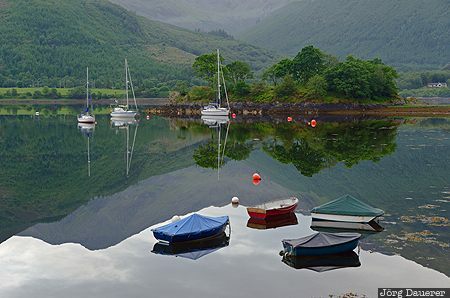 Boats, small islands and and green hills surrounding Loch Leven (also called Loch Lyon) and their perfect reflexion in the calm water of the Loch. Loch Leven is in Scotland, United Kingdom. This photo was taken in the evening of a cloudy day in June of 2013. This photo was taken with a digital camera.